Super Castlevania IV is a 1991 action-platformer video game and a remake of the original Castlevania on the NES. It was developed and published by Konami and is the first Castlevania game for the Super Nintendo Entertainment System. 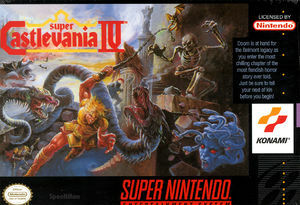 It features expanded play control, 16-bit graphics featuring SNES Mode 7, and a soundtrack featuring brand new pieces and remixes based on previous Castlevania music. Following the same setting as Castlevania, the game takes place in 1691 Transylvania, where the vampire hunter Simon Belmont must defeat the vampire Dracula. The graph below charts the compatibility with Super Castlevania IV since Dolphin's 2.0 release, listing revisions only where a compatibility change occurred. This page was last edited on 28 December 2017, at 15:30.